Two and a half years ago I acquired a couple of peonies through a members-only sale of my local chapter of the North American Rock Garden Society (NARGS). You may not realize this, but most rock gardeners get interested in alpine plants after years of gardening experience. They are all plant geeks and expert (or at least, better than average) at starting plants from seed, because the best alpine plants aren’t offered by the local garden center and NARGS has an awesome seed exchange. So even if you aren’t a rock gardener (and I’m not), you will find great plants at their plant sales. So these peonies weren’t run-of-the-mill peonies. 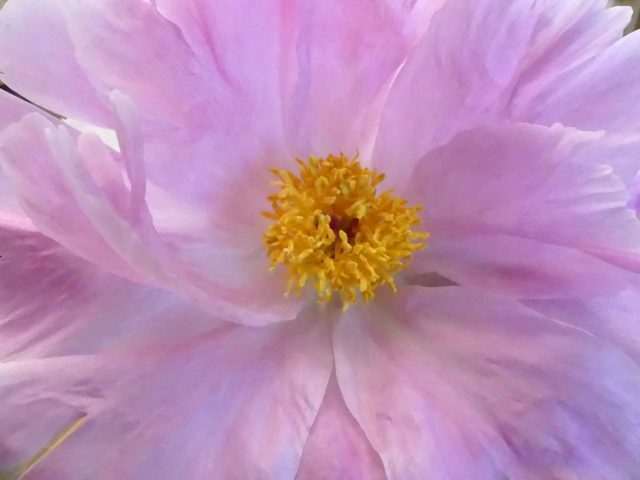 The member donating them to the plant sale was also a volunteer at Cornell Botanic Gardens (formerly called Cornell Plantations) and was on hand when they were digging up their entire peony collection and moving it to a different location. As you might imagine, there were pieces left over, and whether they were expressly offered to the volunteers, or the staff looked the other way when the compost pile was picked over, I don’t know. All I know for certain is that at the August 2014 members-only sale, ‘White Innocence’ was offered and I was willing to pay the price (much lower than retail) and got my name on the list before they were all spoken for. When it came time for digging later in the fall, I was also offered a second peony of uncertain identity, which I gladly accepted. This is the first year they are blooming. ‘White Innocence’ was bred by A.P. Saunders, who lived about an hour away from where I live. It is tall for a peony, attaining 4 feet and even taller. The flowers are pure white. 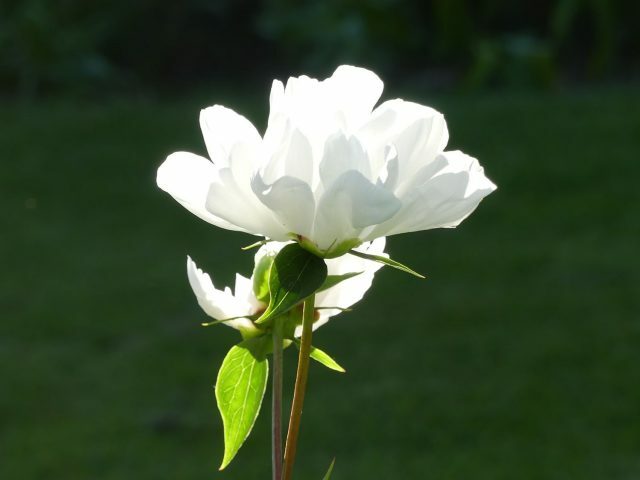 As lovely as ‘White Innocence’ is, the second peony enchanted me even more. ‘Early Daybreak’, ‘Early Sunrise’, ‘Mermaid’, and ‘Early Dawn’ are all names suggested by the donor of this peony. ‘Early Sunrise’ doesn’t appear to be a valid cultivar name. 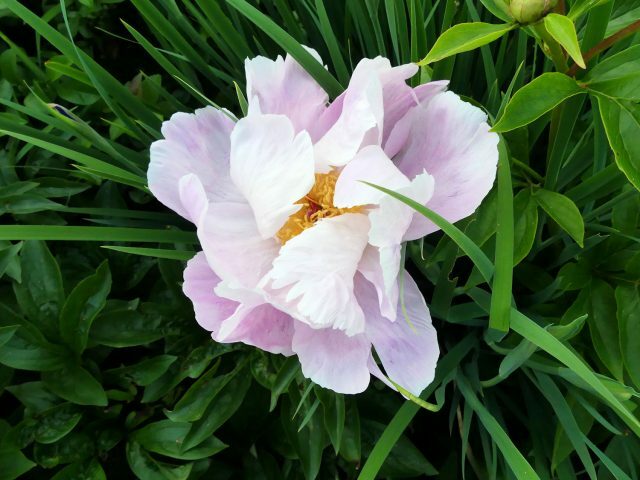 I couldn’t find a valid image for ‘Mermaid’, but it’s described in the Peony Registry as a “single flower of palest lavender.” This peony is pink, not lavender, and to my eye looks semi-double, not strictly single. ‘Early Dawn’ is “rose red,” so that’s not it. That leaves ‘Early Daybreak’ as a possible name. ‘Early Daybreak’ is described in the registry as “Single – White – Hybrid. Old ivory flushed rose. Very sturdy grower. Quadruple hybrid, albiflora, Officinalis, macrophylla, Mlokosewitschi.” It’s another Saunders peony with a complicated parentage. That appeals to me. Problem #1: the color. I would describe the peony I have as pink with just a suggestion of coral. But I noticed the longer it was in bloom, the paler it got. Perhaps in a climate warmer than mine, it bleaches out and appears even paler, “ivory flushed with rose.” Another charming attribute of this peony is that it folded up its petals every evening and opened them up again in the morning–even in a vase. Problem #2: the number and shape of the petals. Do you see above how there is more than one layer of petals? And the edges of the petals are notched? Cornell’s own image of ‘Early Daybreak’ shows much paler petals, and the number and texture of them seem quite different, too. They have an image of the overall plant on their website, and the habit of that plant is very different from mine, which is almost as tall as ‘White Innocence’ and not nearly as compact as the image in Cornell’s image gallery. This image most closely matches the color–but the petals still don’t look right. The image at this website gets the number of petals right and has the notches–but the color is much paler than my flowers. However, they describe it as “shell pink,” which I think is pretty apt. In the topmost image, the first peony is ‘Bev’, one that I’ve had for quite a while, then ‘Early Daybreak’ (presumed), then ‘White Innocence’. Beautiful photos and some beautiful peonies! 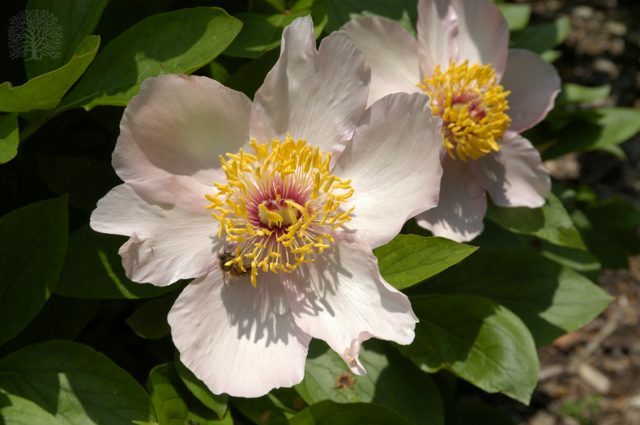 I have yet to be bitten by the peony bug but do have one monster of a plant which grows too tall, has too heavy a flower, and doesn’t even have a fragrance. The only thing it’s good for is cut flowers and they make a huge, amazing bouquet. Kathy, your peonies are lovely. The only 2 peonies I have right now are Blush Nymph planted as bare roots from Walmart 5 years ago. Part of the proceeds went to the Susan G Komen Breast Cancer Foundation for research. This year the flowers were exceptionally beautiful. Approaching my first year (August) after being diagnosed with Breast Cancer in 2016, they have special significance to me as a BC survivor. Flowers may seem seem fragile, but they are blessed with an inner strength to withstand the wind and the rain. Jane, my mother is also a breast cancer survivor. She’s 88, and I think she was diagnosed and treated more than 20 years ago! I love any plant that has special meaning for the gardener. 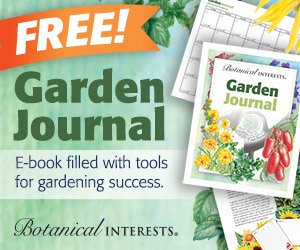 It gives the garden an emotional depth. What a fabulous site. I think I found new favorite blog. Bookmarked! I will be back. Do you have any images of the 4 foot stem of your ‘White Innocence’ image? 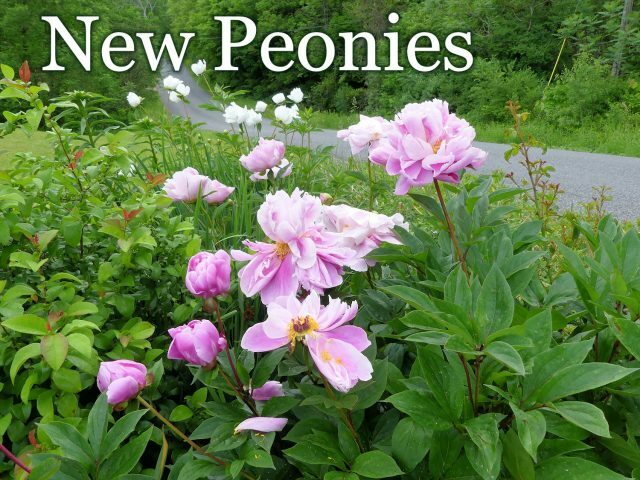 The top image of this post shows them in relation to some other peonies, most of which are three feet in height. But I think they might get a bit taller as they mature and build up strength. When ants get into the peony flowers, they don’t do any harm. I don’t worry about it at all. Read this article for details. Your peonies are delightful. I especially like the top one, ‘Bev’. Alas, my peonies are all succumbing to disease. My research indicates root nematodes for which there is no cure. Plants must be destroyed and new ones can’t be planted in the same place. Oh, Pat! What terrible news! I hope you can find another spot for them. I admire your tenacity, Kathy. Knowing the name wouldn’t be nearly as important to me as it is to you. But in trying to determine the name, you are forced to observe minute differences, which for me would definitely enhance the pleasure. Hope you find the right name… or maybe it’s a one-off? I contacted the source of the photo that most closely matches mine and he seemed to think it was ‘Early Daybreak’. I’m sticking with that for now. I don’t know why so many sites show something that looks so different. Your new Peonies are both gorgeous. I have a species Peony, P. Mairei, whose buds are very dark magenta, it opens deep pink and gets more and more pale as it ages. That fact is noted in descriptions of it so apparently that is a trait of some Peonies. Not knowing the name does not affect the beauty of any flowers, they are still beautiful and look fabulous in your glamour shots. They are lovely! You are a good tracker…I hope you track this down! Peonies are one of my absolute favorites and yours are certainly lovely! I understand perfectly well your desire to know the correct name for your unknown pink beauty and hope you’re able to solve the mystery. My husband and I visited the Plantations in June of 2007 and saw the magnificent peony garden. 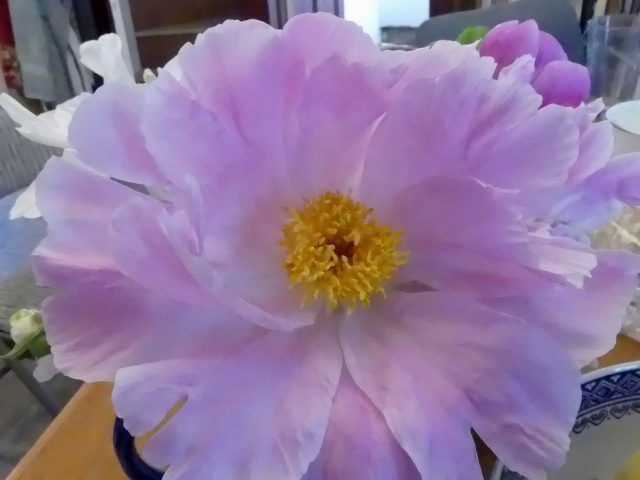 I was enchanted to see such a wide variety of peonies, including some really unusual colors. It made a lasting impression on me. 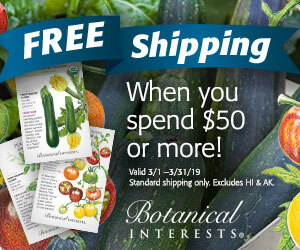 Lucky you to have a couple of them in your garden.